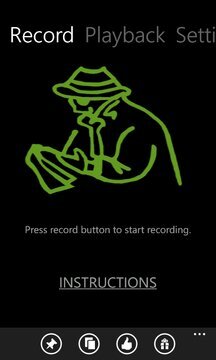 - Record voices if any depending on microphone sensitivity. - Upload your recordings to cloud and then download to your PC. - Set timer to delay the start of recording. - Password protect your recordings to make sure nobody else can access your recording even if they have the phone. - The closer is the phone to the sound sources the better quality you will get. - Make sure you keep an eye on battery. It consumes 10%-15% per hour depending on the microphone sensitivity and sound sources around the phone. - And most importantly, the app is FREE! 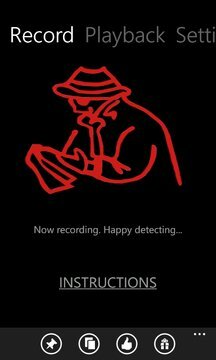 - If you hear mysterious sounds coming around the house you can use Detective to capture them as evidence.